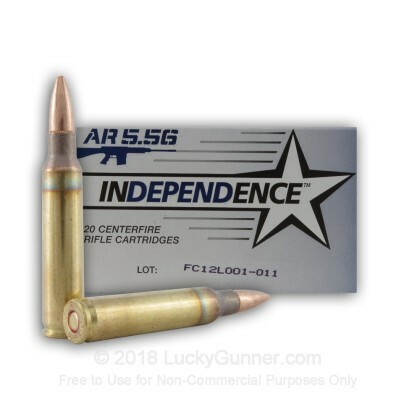 5.56x45mm ammo for your AR-15 is now available through Independence! 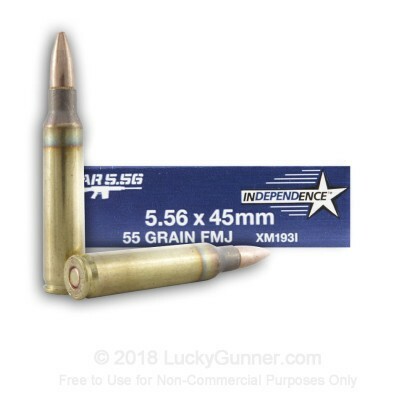 Independence, owned and operated by ATK, contracted with IMI (Israel Military Industries) to produce additional 5.56x45mm to help bridge the gap with the current shortage. IMI is Israel's government run military production facility tasked with producing ammunition for the Israeli army. IMI's ammunition is put to the test everyday in the hotbed of Mideast turmoil. Primers came out of the brass after firing. one jammed my bolt had to have a gunsmith remove the bolt... expensive. This ammo serves its purpose!! No complaints. For the price I can't complain one bit!! I've bought a bunch of this stuff and have found it to be decent performing ammo. That said, the latest batch has some QC issues. Inconsistent sealant application, nicks in the brass and, in one box, some rounds had damaged shoulders and dented cases. It's not clear if this particular box was damaged during shipping or left the factory with these defects. I saved the box and some of the rounds and will upload pics if I can figure out how. Generally I've been happy with Luckygunner but I'm not thrilled with having to throw 25 rounds away - it just increased my CPR significantly. Shot several hundred rounds in a defensive carbine course right after receiving the ammo. No issues of any kind. I look forward to purchasing more. can't speak for ever batch but it's been super reliable so far. Iv ran about 2k of these rounds through my 10.3 Daniel defence upper and have had no problems what so ever. Would recommend these for reliability and training. I just purchased a 500-round case of this ammo, then fired off several hundred rounds in a defensive carbine course. The ammo worked flawlessly. Add in the great price and on-time delivery, and we have a winner! This stuff is absolute junk. I'd take an occasional ftp over the fact that this stuff won't seat in the chamber of my rifle. It was confirmed by 2 local, reputable gunsmiths that it was definitely not my rifle. I guess its bad when you trust that "ammo could never be the issue" and you start second guessing your rifle. I was happy to find out that it was the ammo. Looking at this stuff you can see the difference in overall length in this and another type of ammo. And I mean it is plainly evident with the naked eye. The bullets are not seated fully in the case and they get lodged in my barrel. Junk ammo and obviously zero quality control on their end. Buy some Tula. At least then you expect a few issues out of it. Or PMC. I've never had any issues with that in any rifle I've ever shot. Can't beat this ammo. 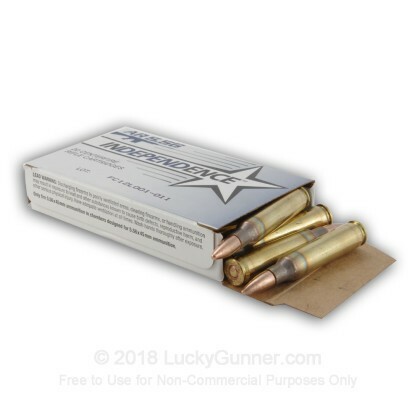 Zero problems with the ammo, and great service and price from Lucky Gunner. This is the only place to buy bulk ammo. Great investment in "precious metals"
Bought 500rds of this stuff and I'm about 1/2 way through it and I've had about a half a dozen rounds that didn't fire and 3 primer blow outs. These all occurred out of the same 2 or three boxes, so I'm hoping it was a bad batch. I've order more because I haven't given up on this stuff yet. Fist 60 rounds were good. After that primers started blowing out. Out of 200 rounds shot. 3 no fire, 10+ primers blew out. New AR and it functions perfect with Privi/Part. And 2 other mfgs. Loved the price but can't depend on them. I have some casings to prove my point. Really great product. Fast shipping. There were about 10 rounds out of the 500 that were bent and unusable, and we're just a tad dirty. Other than that great practice rounds and I will Definately be purchasing more. Keep up the great work. This is the only place I will purchase ammo from due to the price. Can't find anything cheaper even with shipping. Hope this helps people. Best Bang for your buck. I know bad pun. This was the best deal i could find anywhere so i ordered. What completely blew me away was that i received the ammo the next day!! How could it get any better. Rounds were completely what i expected and i'm already half way threw them! Luckygunner.com Rules! I'll never order ammo from any other site. Thanks Chris and Angela! This is what a business should be. Our group shot over 2000 rounds of Indepedence 5.56 ammo without 1 hiccup during a recent training session. Would definetly buy this ammo for my own range use. Great product. No jams. Once again great price and fast shipping. What could you ask for better than that. Thanks Lucky Gunner! Best ammo company I have ever dealt with. Great Ammo. Excellent product. Great vendor. Fast shipping. Super packaging. Ask for free over box. Will definitely use LUCKY GUNNER for all my future purchases. Ammo was decent. Not dirty. Was more accurate on my AR than the .223 I was using. Price was great, quick delivery. Will buy from this site again. Great ammo, shoots pretty clean. No misfires or problems. Great value from luckygunner and they shipped same day! As always, super fast shipping and a great value. The only thing that could have made this purchase better is if you sold them to me for $0.10 per round. ; ) Thanks again and Semper Fi !! As always, on time and the price is right. This is the place I order all my ammo. Couldn't ask for a better transaction! Product exactly as described! Great ammo and service by LG! I ran several hundred rounds of this ammo through two different AR platforms and had ZERO problems with it. I put it to the test Dec. 26, 2015 while blasting leftover fall pumpkins. It shot accurately at targets, but the real fun was running through 20 round mags rapid fire until I had pretty much made pumpkin pie! Thank you Lucky Gunner for providing me with quality bulk ammo at great prices!!! SHOOTS GREAT, NEVER ANY MISFIRES, AND GREAT FOR THE RANGE OR FOR SELF DEFENSE. I HAVE FIRED ALMOST 2000 ROUNDS OF THIS AMMO THROUGH MY L.W.R.C. M6SL AND HAVE NOT HAD ANY ISSUES. GREAT PRICE AND GREAT PRODUCT. GLAD THEY HAVE IT BACK IN STOCK. I have shot over 500 rounds of Independence Ammo and love it. I have experienced zero problems. It is accurate and clean. Great value. Lucky Gunner is awesome to buy from. Excellent service! Very aggressive prices,next day delivery.Outstanding! It shot very well, but put out a stange odor compared to the American Eagle by Federal. Shot 40 rounds of it, didn't have a problem. The odor is why the 4 stars on quality. I have fired several mags of this ammo without any problem at 100 yds. Very Accurate. I also received the ammo 24 hrs and 15 minutes after I ordered it. This was regular FedEX. Great Service. I tried this stuff in a stainless barreled AR and was very displeased. It is the only ammo, out of over a thousand rounds through this rifle, to ever cause a failure. Also, this stuff is filthy. 100 rounds of this left my AR BCG and receiver interior covered in muck. I would not recommend. Dispatched several hundred round of this through my Mini-14 without fault or fuss. Runs fairly clean and consistent too. Would not hesitate to use for trips to the range. I have now shot 50% of the 500 rounds that i purchased. I have have no issues whatsoever. I have used p-mags 30 rounds . also in my beta clone 100 round drum , as well as the regular metal 30 round mags, also in 4 of my metal Stag Arms 40 round mags that they sell online. they were all shot through the same AR from Stag Arms the model 3L . I would purchase more when available My groups were very acceptable at 100 yards. My buying experience from luckygunner was great as well . This was my first purchase from them Thanks. Great ammo. Worked perfectly with no jams. Good price. I have no complaints. No problems out of AR. Delivered on time as promised. Good ammo always in stock and on time delivery will be buying again. This stuff shoots OK from my bushmaster. The groups are acceptable, though this is not match ammo by any stretch of the imagination. I really bought it because I wanted some inexpensive ammo to fire to set up my optics. and to collect brass. I was more interested in consistency than benchrest accuracy and it meets that bill. No feeding problems that were the fault of the ammo. Cannot say that the Federal 193 is any better. dude1,my mini 14 has no problem with this ammo,long yes,gook in the wire! Semper Fi. I expected better quality coming from Israel. I bought over 1,000 rounds and every one of them are horribly out of spec. The cartridge OAL on them is so long that they would not load in some of my magazines. After shooting 300 rounds they were all over the place. When I went to reload them EVERY single case was .028 too long. This is ridiculously out of spec. I have to trim every single case, this is very time consuming. I have never had to trim cases until after they have been fired a few times. I have had several feed jams as well. I would not stake my life or the lives of my loved ones on this ammo. I will not buy anymore of this ammo. Ammo is of good quality. In today's market not a bad price. Miss the good ol' days prices!! I have been more than pleased with this ammo and the service is great as well. Took girlfriend out to the range for the first time and fired over 200 rounds w/out any issues. I purchased my first box of 500 rds while in Afghanistan and once I returned I saw there was a sale so purchased another 500 rds. Lucky Gunner is a true winner in my book. I've even turned on others to the site while they were purchasing ammo at other places at a much higher price. Purchased a 500 round block. Ran 100 rounds through a new AR without a hitch. Good luck trying to top this value! Ran a hundred rounds through a brand new AR and never had a problem with misfires or hang-ups. Going back to the range this weekend with new optics and an adjustable stock to run a "few" more rounds. Shot about 300 rnds of this with a buddy, Used a suppressor for about 150 or so. Accurate dependable and very clean, even with the can the rifle is no where near dirty. I hope the price comes down to the good ole days but still it didn't hurt tooooo bad. The cases are Federal, to some thats a show stopper, I have reloaded FC brass at least 3 times and don't see why I couldn't reload these as well. I will buy buy more but IMI and LC always get the nod. Took my sons out and shot up all 500 rounds without a foul or missfire. Good stuff I will buy more of this again. Have fired about 200 rounds without a foul, and have been able to shoot 2 inch groups at 30-40 yards standing up. Can't complain about that! 200 rounds no misfires fairly accurate and good price. I went through 300+ rounds in my ar 15, great ammo,accurate and clean. I will be buying more!!! Glad I found Lucky Gunner. Got my ammo here when no one else had any.Haven't fired any yet but I trust the other reviews.I'm sure to be back for more.LG could have jacked prices up like all the rest but gave me a decent deal considering the times we are living in. I say stock-up now folks. You never know what tomorrow will bring. 200 rounds through my Knights Armament W/O a FTF or FTE. The ammo is clean and is accurate and dependable. Great ammo...I've only shot 100 rounds so far, but all did great, very accurate. I'm not going to say that I bought this stuff for the *best* price ever...but it was more reasonable than most, it's great quality, shoots well, very accurate...and the shipping was super fast. Can't go wrong here. Fine quality ammo, very clean burning, fair price. Good product. Decent price. Great service. My Black Gun loves this stuff..........If it's good enough for the Israelis you know it's good. They cannot afford to miss. Nor can I.
mini 14 loves this ammo! This ammo is a great buy given todays prices. I see that it has gone up in price again since I bought my last 500 rounds last month . It is very accurate from my Knights Armament Mod 1 with no FTF or FTE issues. There is no more residue left after a day at the range then you would expect from the highest priced ammo. I have sent thousands of rounds of this ammo down range with no problems. My ar 15 runs these great and they are acceptably accurate, however they are FC brass and aren't considered suitable for reloading. Consistently much lighter than LC or other commercial brass like PCM or Remington..
Just put the first few rounds through my Rock River LAR-15LH with outstanding results. Just sighting in a new scope and had as good as 0.5 in. groups with this ammo. THIS IS THE STUFF YOU WANT TO KEEP READY TO GO AT ALL TIMES! WHATEVER YOU MAY HAVE HEARD OR WHATEVER EXPERIENCE PEOPLE HAVE WITH OTHER AMMO, THIS STUFF IS HOT COMING OUT OF THE MUZZLE! THE VERY FIRST SHOT MEASURED 3672 FPS AND 3 MORE SHOTS WERE WITHIN THE SAME NEIBORHOOD! THIS WILL DO THE JOB WHETHER COMPETITION SHOOTING, RANGE FUN, OR SELF DEFENSE! IT'S GOOD FOR ALL THAT!!! THANKS LG FOR HOOKING ME UP WITH REASONABLE AND RELIABLE AMMO! I'VE FIRED 500 ROUNDS THROUGH MY LWRC M6SL AND IT SHOOTS GREAT. VERY ACCURATE AT 300 YARDS AND EVEN MORE ACCURATE AT EVEN 500 YARDS. BOTTOM LINE, BUY THIS AMMO WHILE IT'S STILL AVAILABLE. I FEEL IT SHOOTS BETTER THAN FEDERAL LAKE CITY AMMO. JUST MY OPINION. 5.56/223 is tuff to find now a days due to "current conditions" (ahem ! )............anything the Isralies manufacture is good enough for me. The price was high but all ammo now is high but a week after I bought mine, Lucky Gunner had some cheaper ! Shipping was very fast.......ordered Monday, in my hands by Wednesday. This is a fine quality ammo. I find it to burn clean leaving only small amounts of GSR. I find the accuracy and consistency is right on at 100 yards 2" groups out of my M4 and slightly tighter with my mini 14. Thank you Lucky Gunner for finding good quality ammo in these hard times. Q: Do these rounds have a crimped in primer? thanks! A: Hello Jim, The Independence 5.56 ammunition does feature a crimped primer. Q: Is this steel core ammo? In other words, could I shoot this at an indoor range with a rifle back stop? A: Hello Stefan, This ammunition is loaded with a standard copper jacketed, lead core projectile and does not feature any steel. Q: I've heard that this ammo tends to run hot. What's the muzzle velocity on this lot? A: Hello Will, Independence lists the velocity of this round at 3165 fps. A: Hello William, No, the 5.56 and .223 rounds are different. 5.56 has a higher chamber pressure than .223 and should not be fired in a firearm that is only chambered in .223. You can safely shoot .223 in a 5.56 rifle however because of the lower chamber pressure with .223 rounds.